People can lose their belongings—or, tragically, their lives. Neighborhoods, sometimes even our own, can flood and buildings get knocked down. Entire cities can be shut down, residents trapped in their homes, and emergency responders evacuated when yet another hurricane rolls through already impacted areas. Oil and gas infrastructure can be torn apart, releasing hazardous materials such as oil into coastal waters. 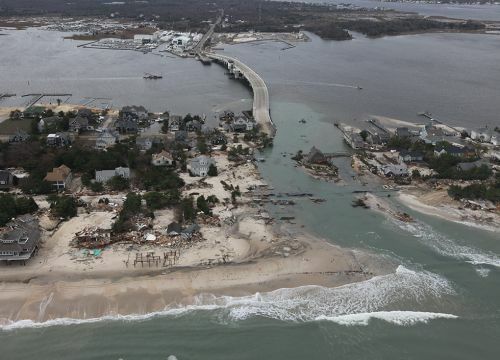 Houses, boats, and a variety of debris can be swept out into the ocean. The very shoreline can be reshaped. NOAA's Office of Response and Restoration also takes care to prepare for hurricanes and other disasters. Sometimes that means building internet and phone access into the stormproof bathrooms of our facilities so that we can continue providing sound science and support to deal with pollution from a storm. Other times that means working with coastal regions to create response plans for disaster debris, training other emergency responders to address oil and chemical spills, and developing software tools that pull together and display key information necessary for making critical response decisions during disasters. Learn more about how to protect yourself and your belongings from a hurricane.